Hi Carrie! Love these post on toliet training. A huge help! 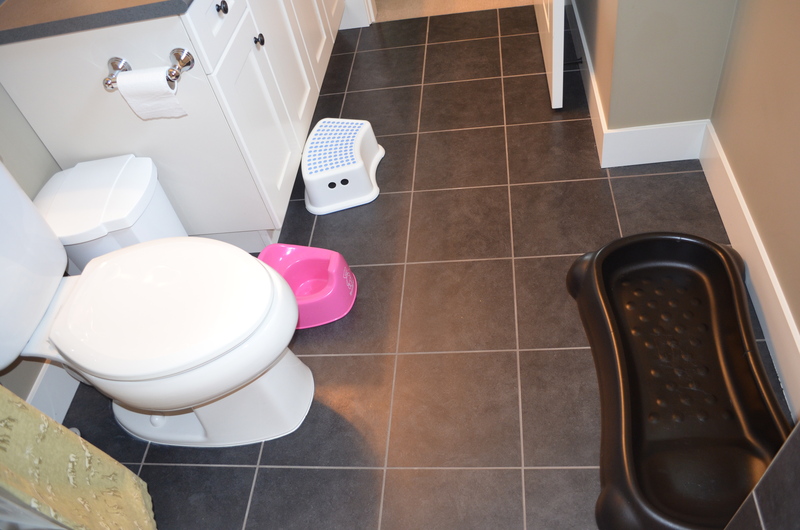 Quick question: what to do if the only bathroom available is too small to fit a changing station for the child? My bathroom was an awful awkard shape. I don’t have the space to sit like you in the photo and there is nowhere to fit confotably me and her. i am trying to plan ahead, but i am finding this obstacle…any thoughts?! If you can figure out how to wipe without laying down you don’t need the change pad in the bathroom. I really lucked out with my bathroom that it fit there perfectly. In my downstairs bathroom is it much smaller and I am very cramped sitting with her. The first couple of times I just put her over my lap and wiped her so perhaps you could try that. I believe others have moved their potty to right outside their bathroom to provide a little more manoeuvring room but still keep the association of the bathroom for toileting needs. Great post! 🙂 I wish I has started this with Little Bee when he was younger. Now he can stand, walk, and almost run. So whenever I try to change him standing up, he wants to run away. That is not a good thing when there is poop involved! I will keep trying. You could try involving him as much as possible with the diaper change. This really works well for standing diaper changes as the child can grab a fresh diaper, a wipe, help pull down pants, etc. Sometimes my daughter likes to play with her clean diaper or underwear as I wipe her. This might help him to be involved & “occupied” while you figure out how to wipe and do a standing diaper change. Perhaps this is not something you’d try, but here in Italy the bidet is a beloved member of the bathroom. After a poopy diaper (or even a messy trip to the potty), I will wash her in the sink (our actual bidet is currently her sink area). This eliminates the need to ever lie her down for a diaper change and fresh all day! Thank you for your comment over at my blog! I’m so happy you talked about standing diaper change! I trained for Montessori 3-6 and only have some knowledge of infant Montessori through my own readings so I’m glad you guided me towards this! My instinct was telling me to change diapers while she was standing up, but didn’t know it was Montessori and didn’t think it was something I can do properly. I’m going to do this today and practice! Thank you so much! Thank you for the pictures. I have been trying to do the standing diaper change for awhile….but getting it into the bathroom was my barrier. Your post helped my family soo much. Thank you! So glad you found it helpful! It was a struggle for me at first too but like all things, just give it a solid effort and you will find a way that works for you, your child, and the diapers that you use. Any idea on keeping curious hands out of the toilet while you do this? I didn’t have this problem as A. used her hands for support on the toilet lid at first. I engaged her by talking to her about the process and involving her wherever possible. She played with a clean wipe or a clean diaper. When she became able to do so she would obtain these things and pass them to me. You might find that the toilet doesn’t work for you. Perhaps try using a stool for support or install a little bar for your child to hold onto. If your child is able to stand independently, then no support is needed. Good luck! This is a wonderful article on the process of learning how to support independence as a child is showing readiness.